Charles “do Bronx” Oliveira. Have you ever heard of the name before? You soon will after his win over Efrain Escudero Wednesday at “UFC Fight Night 22.” Despite being the smallest contestant on the fight card, the 20-year-old left the biggest impression and will be rewarded handsomely for his exceptional efforts. He may have originated from the slums of Brazil, but he should be bouncing from there fairly soon. Although, his underprivileged upbringing is why he didn’t bat an eye when Escudero came in three pounds too chubby for their lightweight battle. 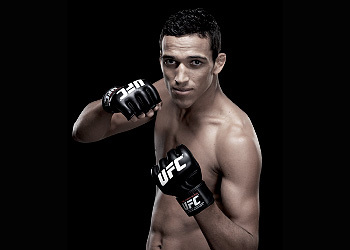 Oliveira was then presented with two choices; make the “The Ultimate Fighter 8” winner exhaust himself by trying to lose the excess weight, or accept a 159-pound catchweight bout where he would pocket 20 percent of Escudero’s show purse. Escudero earned $15,000 just to enter the Octagon at UFC 114. Assuming his salary stayed the same, Oliveira pocketed an additional 3K just for showing up last night. Furthermore, the jiu jitsu practitioner parlayed his 3rdRound rear-naked choke into a $40,000 Submission of the Night bonus. In professional sports, stardom and money tend to go hand-in-hand. While that mentality has reigned supreme among those that have come before him, the youngster is looking to bring a fresh approach into the game. “I’m thankful to be undefeated and to be 2-0 in the UFC, but I’m not changing anything,” he stated. “I just want to be the same guy. Maybe one day I’ll start to change, but my teachers will then tell me immediately when I’m doing something the wrong way and will tell me to come back to the right way. Charles “do Bronx” Oliveira. Remember the name.